This Walking trip goes from Paro at first sightseeing in Paro includes a visit to the northern part of the valley to Drukgyel Dzong ruins (Monastery Fortress) that once was a strategic post to withhold invading Tibetan forces from the north; visit the famous Kyichu Lhakhang- one of 108 sacred Lhakhangs built by the Buddhist King Srongtsen Gampo of Tibet. Visit the district Dzong called Rinpung Dzong- fortress of a mountain of jewels, which is now the seat of administration and an institute to the monks; the Natural History Museum at Ta Dzong is one of the finest in Asia, Hike up to the Tiger's Nest known as Taktsang--one of the most spectacular and most sacred pilgrim sites to all Buddhists. One of the great founders of Tantric Buddhism- Guru Padmasambhava is known to have flown on a tigress to meditate on the cliffs--the tigress being his consort the divine Yeshe Tsogyel. Drive to Thimphu Dochula pass to view the stunning scenery of the Himalayan ranges; descend to the old winter capital of Punakha; visit Wangdi phodrang Valley; Drive to Bumthang via Tongsa-the biggest Dzong in Bhutan and the seat of power in 19th century Bhutan; walk to the Watch Tower Ta Dzong that once guarded the Dzong below; continue drive to Bumthang valley, then drive back from Bumthang/Punakha Thimphu/Paro. Day 1. KTM-PARO: transfer to hotel tiger nest resort, set in the pine trees in direct view of the most famous buddhist monastery in the himalayas. Day 2.Paro: Sightseeing in Paro includes a visit to the northern part of the valley to Drukgyel Dzong ruins (Monastery Fortress) that once was a strategic post to withhold invading Tibetan forces from the north; visit the famous Kyichu Lhakhang- one of 108 sacred Lhakhangs built by the Buddhist King Srongtsen Gampo of Tibet. Visit the district Dzong called Rinpung Dzong- fortress of a mountain of jewels, which is now the seat of administration and an institute to the monks; the Natural History Museum at Ta Dzong is one of the finest in Asia. Hotel. Day 5. Thimphu: Morning visits to the Kings Memorial Chorten; the handmade Paper Factory and the Archery Grounds where Bhutan's national sport of Archery can be witnessed. Afternoon visit the local Handicrafts Center and the Traditional Medicine Hospital; stroll in the capital town of Thimphu, Hotel. Day 6.Thimphu/Punakha: Early morning drive over the 10,000 ft pass of Dochula to view the stunning scenery of the Himalayan ranges; descend to the old winter capital of Punakha; visit Wangdiphodrang Valley; overnight at Hotel. Day 8. Bumthang: Considered the most sacred & religous of all the valleys in Bhutan: In Jakar view the Dzong known as the White Bird Dzong and drive to the Flaming Lake - Membartsho- where the sacred religious treasures were found in the 15th century by Terton Pemalingpa the Treasure Finder and reincarnation of the emminent Buddhist saint Guru Padmasambhava. Day 10. Punakha/Thimphu/Paro: Drive to Thimphu; visit Simotkha Dzong; after lunch continue journey to Paro. Day 11. 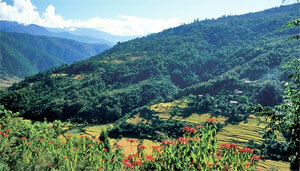 Paro-KTM: Drive to Paro Airport for onward journey.